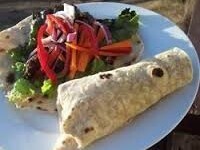 "Thinly sliced beef is marinated in an Asian inspired lime-sesame sauce, cooked, then wrapped in tortillas with red leaf lettuce." Toasted Sesame Seeds - 2 tsp. Reduced-Sodium Soy Sauce - 2 tsp. Place sliced beef in a shallow bowl. In a jar, combine garlic chili lime chicken splash, lime juice, honey, oil, soy sauce, sesame oil and grated ginger. Seal lid tightly, and shake until well combined. Pour over beef, and marinate 30 minutes. 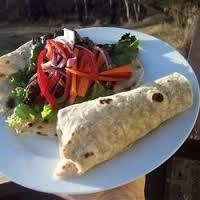 Place lettuce leaves and sliced avocado on tortillas, and evenly distribute steaks slices between all tortillas. Fold bottom of tortilla up by 1/3, then tightly roll from the side until wrapped.